FIRST; our golf computer, ScoreCard Cady®, will keep your foursomes scores and tell you after each hole who is leading and by how many strokes and what the par is for the hole and how may putts each player has taken. At the end of the round it will tell you each players raw score for total strokes and putts and will handicap each players score for that round and that course for better comparisons of how well everybody did. 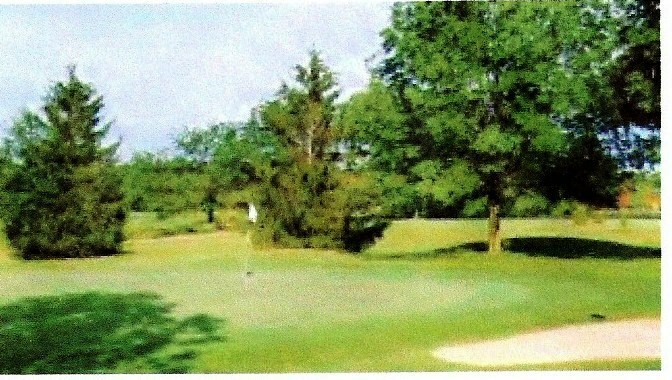 SECOND; there is a screen to help you select the right club based on your swing and the wind and weather on the course. THIRD; there is a screen of tips for difficult lies like ball above your feet or below your feet etc. FOURTH; there is a screen to calculate your USGA and PGA golf handicap based on your recent scores and the rating and slope of the courses you played. Best part is that all this is available on an Excel application on your smart phone. Sadly, the answer was no. Being a jock all my life, if the average guy hit his 9 iron 120 yards, I HAD to hit mine further... 130 yards or 140 yards or maybe even 150 yards. In my youth I was a baseball pitcher and I could really bring the heat, you know, throw a strawberry through a locomotive. However, when I threw as hard as I could, I couldn't control the pitch and walked a lot of people. I was a lot more effective when I threw at 75% to 80% of full strength. After continually trying to hit my golf shots too hard and losing many balls and continually hitting my approach shots short; I decided to find out how far I actually do hit these shots. As a result, now I only count on 120 yards out of my 9 iron and because I am hitting it less hard, it goes straighter, I can find it, and I score better. It is much better to be an accurate hitter than a BIG hitter. With just this working for me my game improved a lot. Everybody knows that weather & wind affect golf shots but how much? How much does a crosswind affect your shot? or the wind in your face or the wind at your back? How different does your shot go when the temperature is below 50? How does hitting out of the sand or the rough affect your shot? If you don't know the answer to these questions you will still be wasting strokes needlessly. Question: Let's assume that you, like me, have elected to hit softer and stay within yourself for accuracy sake. You to now count on 120 yards out of your 9 iron. You are playing in the early spring when the course is damp and you have a crosswind blowing in your face. Your shot is about 150 yards, what club do you hit? Write this down and then scroll down to see the correct answer. 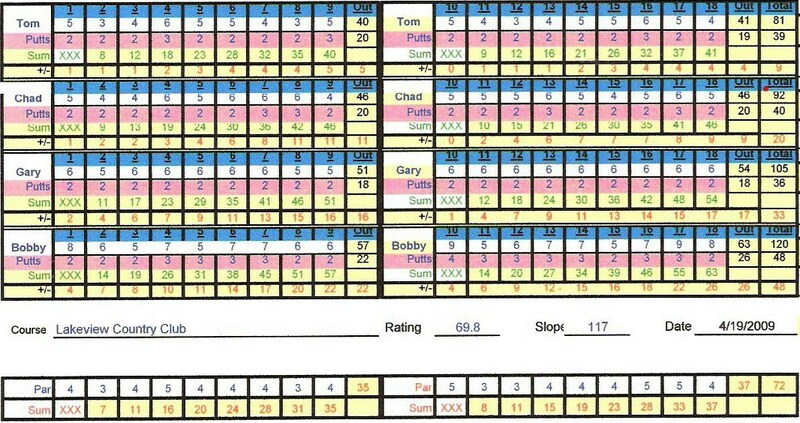 Our ScoreCard Cady® will improve your game and make it more fun. ScoreCard Cady® is an Excel program that is compatible with Windows based Pocket PC programs so that you can add this program to your smart phone. 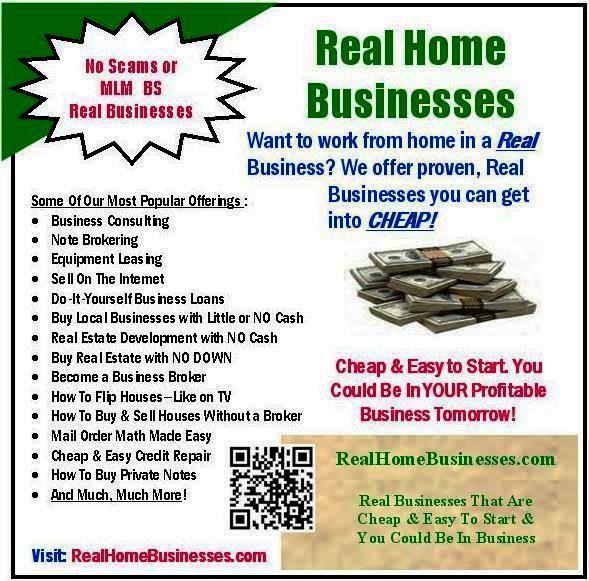 I have a Smart Phone and this program works great. . Any phone that supports Pocket PC programs can use this program. Before I play my first round, I go to the driving range and find out how far I consistently hit each club. I am particularly interested in how far I consistently hit my 9 iron as the other clubs can be calculated once this distance is known. When I get back home, I enter this distance into the ScoreCard Cady® program. Then I copy this program to my smart phone. Before I play a round I enter the par for each hole into my phone and the names of the players in my foursome. I also enter the course name, its rating and its slope number into my phone. When playing the first hole I can refer to sheet 2 to get Golf Shot Tips on playing a difficult lie. Club Selection - I can refer to sheet 3 and enter some weather data and the distance and it will tell me what club to hit. Golf Shot Tips - When playing the first hole I can refer to sheet 2 to get tips on playing a difficult lie. Club Selection - I can refer to sheet 3 and enter some weather data and the distance and it will tell me what club to hit. Keeping score is a breeze. Click on the picture on the left to see a larger screen view, then click your browsers back button to return here. .All you do is enter each players total strokes per hole and the number of putt if you want to keep track of putts on sheet 1. It is not necessary to keep track of putts. The program will total each players strokes through the last hole and tell each player how many strokes over or under par they are through the last hole. You can see at a glance that after 5 holes Tom leads Chad by 1 stroke (Tom has 23 total strokes through 5 holes while Chad has 24 total strokes through 5 holes). The pictures below are thumbnails. Click on the picture to view a larger image, then click on your browsers back button to return to this page. After the round is over, the program will figure each players handicap and will show the total raw scores (above) and the handicapped scores (below) to add to the fun. It isn't much fun to play with a better golfer who consistently plays better golf than you from a raw score standpoint but once all scores are adjusted by the handicap demonstrated by the round just played, the handicapped scores can prove to be a different matter. On your smart phone keep hole by hole score for your foursome and figure your handicap the way the PGA does and have tips handy for difficult lies. What if it's windy or wet, what club should you use? Our program tells you this. 2. Sheet 2 shows some tips on how to play difficult lies and gathers your score data to figure your golf handicap on an ongoing basis just like the USGA and PGA figure their handicaps. 3. Sheet 3 helps you select what club to hit factoring in your club hitting distances and the weather (cold, wet, &/or wind) and if you are playing out of the rough or the sand. This is guaranteed to reduce your total strokes and make golf more fun for everyone. 4. Sheet 4 uses your last 20 scores and calculates your USGA & PGA Golf Handicap using your scores and the rating and slope from the courses you played; enter up to your last 20 scores. All this from an Excel application on your smart phone.